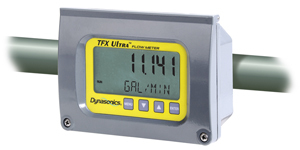 TFX Ultra ultrasonic flow and energy meters clamp onto the outside of pipes and do not contact the internal liquid. The technology has inherent advantages over alternate devices including: low-cost installation, no pressure head loss, no moving parts to maintain or replace, no fluid compatibility issue, and a large, bi-directional measuring range that ensures reliable readings even at very low and high flow rates. TFX Ultra is available in a variety of configurations that permit the user to select a meter with features suitable to meet particular application requirements. The TFX Ultra is available in two versions: a stand-alone flow meter, and an energy flow meter used in conjunction with dual clamp-on RTDs. The energy flow meter measures energy usage in BTU or Tons, and is ideal for retrofit, chilled water and other HVAC applications. for in-line flanges, pipe fittings, strainers, and filters. due to clamp-on sensor design. High performance Flow Meter from Fuji Electric, with advanced features such as the Anti Bubble Measurement system. 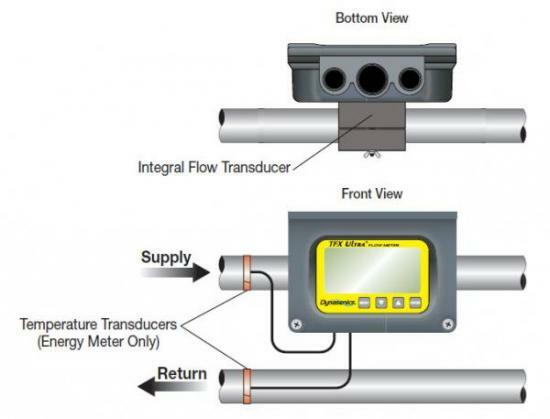 Hybrid flow meter utilizes both Doppler and transit time ultrasonic sound technologies.